Imagine this- pedalling on the meandering roads that are never going to end along the craggy coast as the ocean wave's break along the shore on one side, and luscious jungle on the other side. If this imagination excited you, then pack your backpacks, and set forth on a cycling tour to West India. On this expedition, you experience the striking view of timeless beauties- colonial lifestyle, and stunning historical forts of Goa in a way like never before. Miles of covering the far out and picturesque towns and coast regions of Goa, the west coast cycling tour starts and end at Cavelossim by passing through least explored places like Old Goa, Panjim, Anjuna and Mandrem. This cycling expedition will last for 13 days and initial four days; you will acclimatise to Goa's temperature. Some cyclists even say that one should avoid taking this journey during summer and monsoon as the humidity is at its peaks and evidently becomes tough for paddlers to accomplish the task. 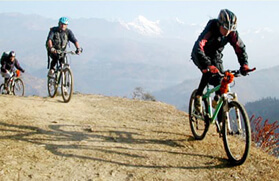 Winter would be good to go as firstly it's a Christmas time and you will get more close with the culture and secondly the temperature is perfect to indulge in some strenuous cycling. 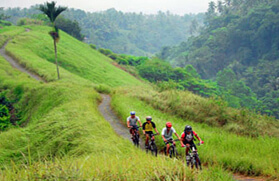 Treat yourself to an unforgettable cycling vacation on Goa and get stunned by all what this state has to offer. For more information about this go through the itinerary mentioned below. Early morning you will board a flight to Goa from your respective cities. On arrival in Goa, you will be transferred to a hotel for an overnight stay and dinner. Today, you are free to explore South Goa. After breakfast, you will have to attend a short meeting, as per which our guide will tell you about the cycling expedition and pass on the instruction manual. Dinner at a local restaurant. Overnight stay in a hotel. Wake up in the morning and treat your eyes with a view of the sun-kissed sea far and wide. On the third day, you will be going for a sightseeing tour to Goa including places like Fartrade, Varca, Benaulim, Colva, Betul Batim, Majorda, Utorda, Cansaulim and Velsa. On the fourth day, you will enjoy more of Goa's culture and cuisines. Today, you will be visiting the commercial hub of Goa, Margao. Overnight stay and dinner in the hotel. Dig up in an early morning breakfast as today is going to be your first day of the cycling expedition and it's going to be a thrilling one. Today, you will be travelling from Cavelossim to Panjim via Old Goa, which is famed for its cathedrals and building that has a Portuguese architecture influence. Overnight stay and dinner at Panaji Residency. Catch an early morning ferry from Panjim, which will take you to the fort at Aguada. After enjoying some sightseeing at Fort Aguada, you will start cycling to reach Anjuna. Further, you will cross the Chapor River to reach the Junas Beach. Overnight stay and dinner at Dunes Beach Resort. From Mandrem, start paddling for 20 km to reach Tiracol Fort. During your journey from Mandrem to Tiracol Fort, you will cross bridges, quite villages and secluded coasts. After reaching Tiracol Fort, start following the trail again to reach Mandrem. Kickstart your day with a hearty meal as today you will be crossing some strenuous trails and coming across challenging tasks to reach Cavelossim. An overnight stay in the Cavelosim resort. Today, you will be going to explore Shri Chandreshwar Temple and after that proceeding towards Chando. After Chando, you will follow the trail that leads back to Cavelossim. After breakfast, you will board a ferry that will let you cross Sal River to reach a hilly region. Once you deboard from the ferry, you will visit the Cabo De Rama, a fort that is believed to be the place of exile of Lord Rama and Goddess Sita. If lucky, you might spot pods of dolphins in the sea. Enjoy a picnic lunch at Cabo De Rama fort and start cycling to reach Palolem. Overnight stay in Palolem. Today, you will be visiting the Cotigao Wildlife Sanctuary, a forest famed for its rare plants and tall trees. When travelling inside the wildlife sanctuary, you will come across many native tribals. Also, you can indulge in mountain walking. After spending some time at Cortigao Wildlife Sanctuary, you will follow the same route back to Palolem. Overnight stay and dinner at Palolem hotel. Post breakfast; follow the trail to reach Cavelossim. Overnight stay and dinner at Cavelossim. Our guides will transfer you to Goa International Airport. Thereon, you will board a flight to your respective city.